Murder by Gaslight: Arthur Spring Jr. vs. Arthur Spring Sr.
Arthur Spring was nineteen years old in 1833 when he emigrated to America from Ireland. He settled in Philadelphia and that same year married a sixteen year old girl who had also come from Ireland. They were together for about eleven years before Mrs. Spring died, leaving Arthur to care for a son and two daughters. Spring had tried his hand at a number of businesses; he had been a saloonkeeper, a grocer and a confectioner. The candy store was the most successful, but the return was too slow to please Spring so he augmented his income with robbery. As a result he served several terms in prison. 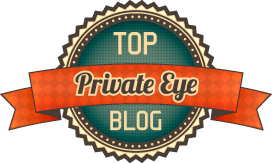 In 1852, all but destitute, Arthur Spring was living in a Philadelphia boarding house with his son, Arthur Jr. – his two daughters had been sent to an orphanage in Washington, D.C. In Philadelphia Spring became reacquainted with Honora Donavan, whom he had known as a boy in Ireland. She was now Mrs. Honora Shaw, though her husband had left her for the California goldfields and was presumed dead. The exact nature of Arthur Spring’s relationship with Honora Shaw is not clear; he would later claim that they were engaged, and were to be married on the confirmation of her husband’s death, others said she did not like him, but helped Spring and his son out of pity. Honora Shaw was living with her sister Ellen and Ellen’s husband Bartholomew Lynch in an apartment on Federal Street, sublet from Mr. and Mrs. John Carroll who occupied most of the house. Ellen Lynch had recently given birth to twins and her sister had moved in to help her with the babies. 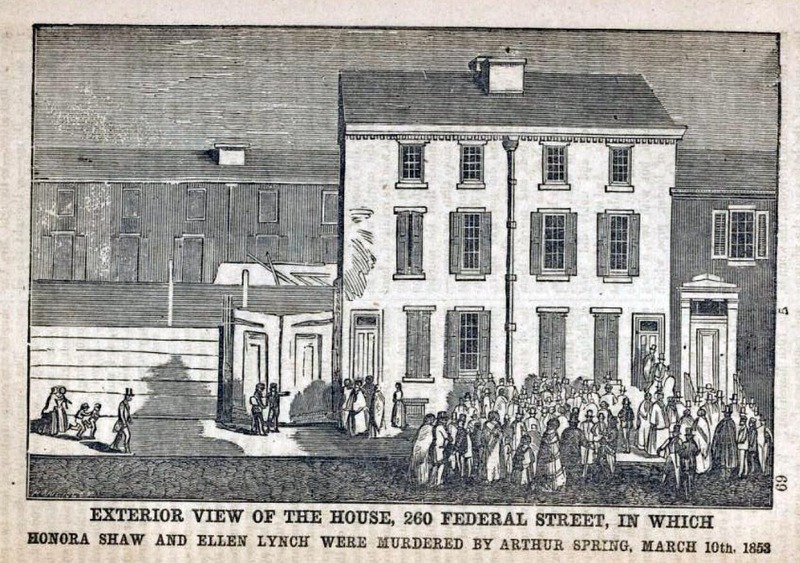 Arthur Spring began calling on Honora Shaw at the Federal Street house, much to the disapproval of the Lynches and the Carrolls. 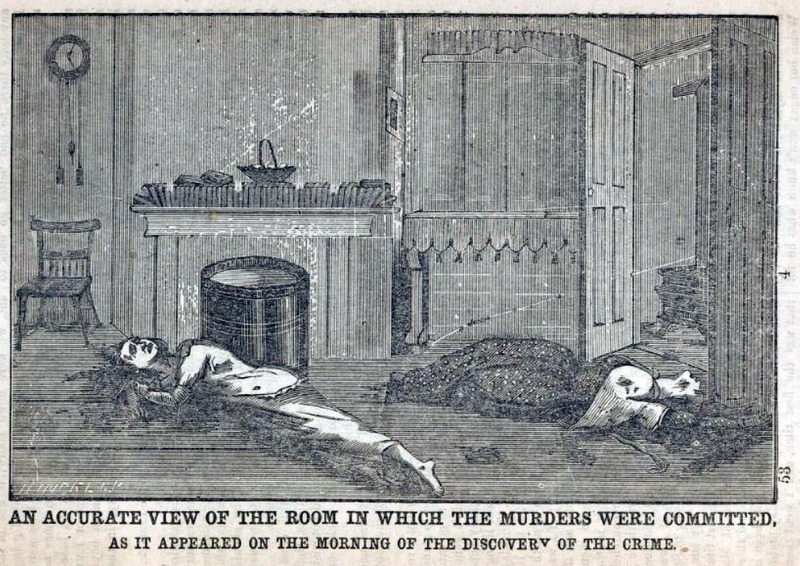 The night of March 10, 1853 Honora Shaw and Ellen Lynch were alone in the house. Bartholomew Lynch had left that day to spend several days in New York on business, and the Carrols had gone to a ball that night. Mrs. Carroll returned from the ball around 7:30 the next morning and in the front room, on the first floor, she found the bodies of Honora Shaw and Ellen Lynch lying in a pool of blood. They had been beaten and stabbed multiple times. Mrs. Shaw appeared to have been attacked suddenly, as there was no sign of a struggle. Mrs. Lynch had gashes on her hands and arms indicating that she had tried in vain to ward off her attacker. Mrs. Shaw had been stabbed seventeen times, Mrs. Lynch forty-one. The sheaf of a knife was found under one of the bodies and a piece of heavy lead pipe was found in the room, covered with blood and hair. Blood stains on doors and walls showed that the killer had gone to Mrs. Lynch’s room and broken into her trunk. The tip of a knife—a three cornered dirk—was lying on the floor where it had been used to pry open the hasp of the trunk. Though the motive of the killings was apparently robbery, the killer was probably someone known to the household. Mrs. Lynch had been dressed in her nightclothes and it is unlikely that she would have left her babies and come downstairs if a stranger had broken into the house. Suspicion fell upon Arthur Spring—in addition to being a frequent visitor to the house, he was left-handed, and from the bloodstains on the doors it appeared that they had been opened by the killer’s left hand. In Arthur Spring’s room police found a shirt with bloodstains in the breast. Spring and his son were arrested for murder the following day. Arthur Sr. called his son a liar and said that it was Arthur Jr., along with some of his companions, who murdered the women. Arthur Jr.'s story was believed, Arthur Sr.'s was not. Arthur Spring Sr. was held for trial. 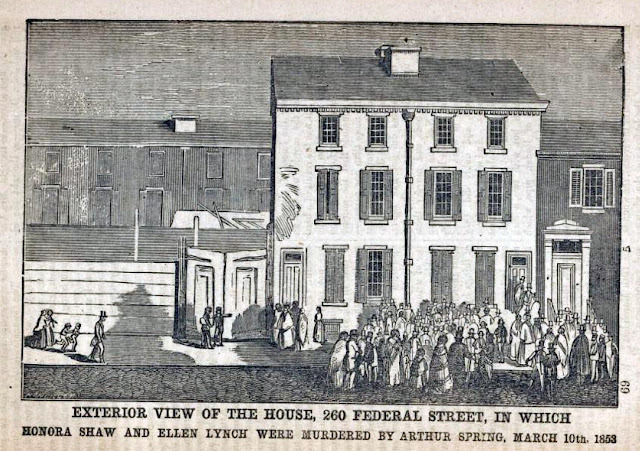 The morning of Monday, March 21, 1853 the Philadelphia Court House was filled to capacity with spectators anxious to see the trial of Arthur. A large crowd had also gathered on Sixth Street, along the route the prison van would be taking to the courthouse. Fearful of a lynch mob, the police took the precaution of placing an imposter in the prison van driven down Sixth Street. They brought Spring to the courthouse in a hack taking a different route. The evidence against Arthur Spring was all circumstantial except for the testimony of his son, and that was quite compelling. Arthur Jr. testified for three hours, relating all he had seen and heard that night, declaring his father’s guilt while stressing that he himself had no involvement in the murders. The defense contended that one man alone could not have overpowered two strong women. The use of two distinct weapons would indicate at least two killers. 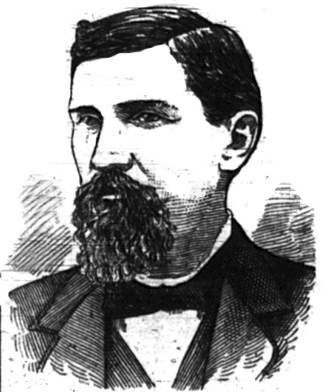 They characterized Arthur Spring Jr.’s testimony against his father as unnatural and self-serving, and they spoke against his character and that of his friends, a group of idlers known as the Outlaws, who hung out on street corners and read the Police Gazette in saloons. On the fourth day of the trial the case was given to the jury who deliberated for three hours before finding Arthur Spring Sr. guilty of murder in the first degree. Soon after the trial ended, Spring’s attorneys received an anonymous letter explaining that there had been an irregularity in the jury selection. At that time a man named Charles McQuillan had answered to the name Bernard Corr when Mr. Corr was summoned. McQuillan continued the impersonation after being impanelled as a juror and never revealed his true identity. The attorneys filed a motion for a new trial and the motion was granted. 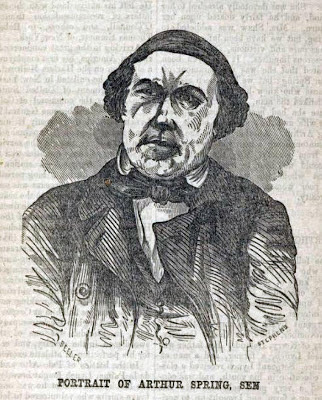 With the exception of meticulous jury selections, Arthur Spring’s second trial, which began on April 4, 1853, was essentially a replay of the first. Spring was once again found guilty of first degree murder. Verdicts: Guilty of first degree murder (overturned); Guilty of first degree murder. As is often the case with convicted murderers, then and now, Arthur Spring “…was made a hero by romantic women.” They had taken a fancy to portraits of him that had been published in several illustrated newspapers. This adoration was short-lived; Arthur Spring was hanged in Moyamensing Prison on June 10, 1853. Spring maintained his innocence to the end. On the scaffold he reiterated that he had not murdered Honora Shaw and Ellen Lynch, but he also declared that his son was innocent as well. When the examinations were concluded the body was sent in a coffin to the coroner but somewhere along the way the remains had disappeared. When the coffin was opened it was found to contain a log of wood and some clothing. The coffin was interred nonetheless. While the people of Philadelphia were happy to see Arthur Spring Sr. hang, very few had any positive words for the son who had betrayed him. Arthur Spring Jr. moved to Washington D.C. where his sisters were still residing in an orphanage. There he took an appointment as messenger in the Register’s office of the Treasury. Jackson, Joseph. America's Most Historic Highway: Market Street, Philadelphia ,. Philadelphia: Joseph Jackson, 1918. Spring, Arthur. The Life and Adventures Arthur Spring . Philadelphia: T.B. Peterson, 1853. "Arthur Spring." Adams Sentinel [Gettysburg] 15 Aug. 1855. "Examination of the Remains of Arthur Spring." The New York Times 14 June 1853. "Execution of Arthur Spring." The New York Times 11 June 1853. "Spring's Body Not Buried." Racine Daily Advocate 27 June 1853.